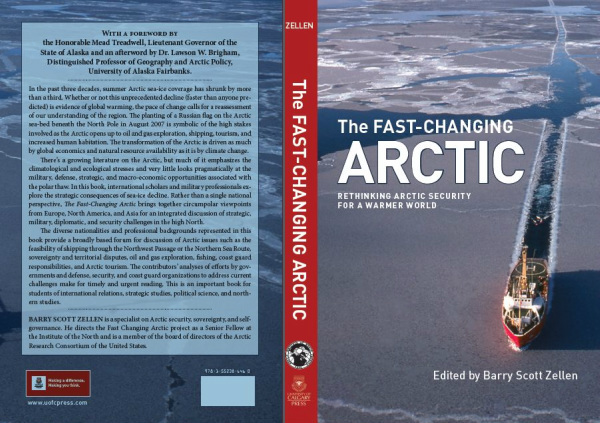 Zellen's newest book on Arctic security was published on July 1, 2013 by the University of Calgary Press: The Fast Changing Arctic: Rethinking Arctic Security for a Warmer World. It's an anthology of the latest thinking about the geopolitical consequences of the polar thaw with contributions from leading Arctic security experts in America, Canada, Europe and Asia. In this timely new book, international scholars and military professionals come together to explore the strategic consequences of the thawing of the Arctic. Their analyses of efforts by governments and defence, security, and coast guard organizations to address these challenges make timely and urgent reading. Rather than a single national perspective, The Fast-Changing Arctic brings together circumpolar viewpoints from Europe and North America for an integrated discussion of strategic military, diplomatic, and security challenges in the high North. Thoughtful analyses are included of different regions, climate issues, institutions, and foreign and security policies. This is an important book for students of international studies, political science, and northern studies. Barry Scott Zellen is a specialist on arctic security, sovereignty, and self-governance. He directs the Fast Changing Arctic Project at the Institute of the North, where he is a Senior Fellow. Zellen also serves on the board of director of the United States Arctic Research Consortium (ARCUS). With a Foreword by the Honorable Mead Treadwell, Lt. Governor of Alaska, and an Afterword by University of Alaska Fairbanks Distinguished Professor of Geography and Arctic Policy, Lawson W. Brigham. With contributions by: Alun Anderson | Caitlyn Antrim | Rasmus Gjedsso Bertelsen | Lawson W. Brigham | Ian G. Brosnan | Daniel Clausen | LtJG Michael Clausen | Lassi Kalevi Heininen | Nong Hong | Rob Huebert | Maj. Henrik Jedig Jorgensen | P. Whitney Lackenbauer | Thomas M. Leschine | James Manicom | Edward L. Miles | Barry Scott Zellen | and | Katarzyna Zysk. Visit: University of Calgary Press. Many have heard about the plight of the polar bear due to the shrinking of sea ice, but few have considered the other repercussions of global warming and the melting of sea ice in the Arctic. Luckily, circumpolar Arctic organizations, governments, and peoples have been considering this for many years. transportation routes and newly accessible natural resources. For example, a Russian flag was planted on the seabed of the North Pole in 2007. Corporations and countries are already positioning themselves to exploit oil and gas reserves currently under Arctic ice. This raises several questions: How can the Arctic nations peacefully manage these conflicting demands? What about the demands of non-Arctic nations that want a part of the spoils? Who will have the right to create and enforce environmental standards and rules? How will indigenous peoples fare? international relations, and northern studies. For BioOne members, you may read the review here. From: Journal of Polar Research, Vol 33 (February 2014), online at: http://www.polarresearch.net/index.php/polar/article/view/23951/html. Reviewer: Kristian Åtland, Analysis Division, The Norwegian Defence Research Establishment. How will the changes currently taking place in the Arctic affect the future nature of interstate relations in the region? To what extent, and how, will the decline in summer and winter sea ice in the Polar Basin lead to changes in the pattern of human activity in the Arctic? How do the Arctic states approach the region and each other, and to what extent are their Arctic strategies compatible? Will the Arctic become an arena of jurisdictional disputes and heightened military tension, or will it become a region of cooperation and prosperity? These are among the core questions addressed in The Fast-Changing Arctic: rethinking security for a warmer world, edited by Barry Scott Zellen. Zellen is a senior fellow at the Institute of the North, Alaska, where he directs the Fast-Changing Arctic project, which focuses on the geopolitical and other impacts of changes taking place in the circumpolar Arctic. Having worked on related issues since the end of the Cold War, as a journalist, editor and researcher, he has established himself as a prolific writer on Arctic and northern affairs. He is the author or editor of about 10 books and has several more on the way. The current book, which is a 400-page anthology featuring contributions by 20 authors, revisits many of the issues that were raised in Zellen’s monograph, Arctic doom, Arctic boom: the geopolitics of climate change in the Arctic, published in 2009. At the same time, the current book widens the perspective and adds new dimensions to the analysis. Overall, it makes for an enjoyable read. The 16 chapters of this book are organized into three main parts, “Arctic climate change: strategic challenges and opportunities”, “cooperation and conflict: paths forward” and “regional perspectives”. The book also includes a brief foreword by Alaska’s Lieutenant Governor, Mead Treadwell, a concluding chapter by the editor (“Stability and security in a post-Arctic world: towards a convergence of indigenous, state, and global interests at the top of the world”) and an eight-page afterword by University of Alaska professor, Lawson Brigham. Zellen has done a great job in assembling the contributions and presenting them for a wider audience in the form of a highly accessible anthology. The book is well structured, most of the relevant topics and perspectives are represented, and all of the chapters add to our understanding of the increasingly complex dynamics at play in the northern part of the globe. Sought by explorers for centuries as a possible trade route, the Northwest Passage sea route traverses the Arctic Ocean, following the northern coast of North America via waterways amidst the Canadian Arctic Archipelago. and connecting the Atlantic and Pacific Oceans. First navigated by Roald Amundsen in 1903–1906, up until 2009, the Arctic pack ice prevented regular marine shipping throughout much of the year. However, climate change has reduced the pack ice, with summer Arctic sea-ice coverage shrinking by over a third in the past three decades. This shrinkage has seen the waterways becoming more navigable. That said, contested sovereignty claims over the waters have complicated shipping through the region. In his foreword, ‘Witnessing an Arctic Renaissance’, Mead Treadwell, Lieutenant Governor, State of Alaska, writes that ‘for Arctic states across the globe, the accessible Arctic Ocean presents opportunities of a lifetime, with energy resources, minerals, tourism and shipping potential making this increasingly accessible region a classic emerging market’. The planting of a Russian flag on the Arctic sea-bed beneath the North Pole in August 2007 is symbolic of the high stakes involved as the Arctic opens up to oil and gas exploration, shipping, tourism and increased human habitation. Much has been written on the climatological and ecological stresses on the region, with little addressed on the military, defence, strategic and macro-economic opportunities associated with polar thaw. Here, international scholars and military professionals explore the strategic consequences of sea-ice decline. Timely reading indeed, on sovereignty and territorial disputes, oil and gas exploration, fishing, coastguard responsibilities and Arctic tourism. Edited by Barry Scott Zellen, who has written extensively on Arctic geopolitics, The Fast Changing Arctic contains contributions from established and junior scholars as well as military and coast guard professionals ... together, they deal with a wide array of Arctic topics, such as military and defense, governance and regional management, Arctic strategies, environmental politics, maritime and shipping developments, and sovereignty and legal concerns. ... Zellen analyzes the U.S. military regional commands in Arctic areas, that is, the Northern Command (NORTHCOM), Pacific Command (PACOM), and European Command (EUCOM) areas. He asserts that EUCOM should, in the future, be responsible for Arctic defense since the potential threat does not emanate from China, whose interests in the region are largely economic in nature, but from Russia. As he puts it: “Proximity to an awakening Russian bear, and experience in taming its more aggressive instincts, will be an important key to a secure and peaceful North” (p. 244). An important part of such Western regional defenses--he maintains--has historically been through close ties to Greenland and Iceland. ... In his treatment of future Arctic developments, Zellen conjures Cold War utopian and dystopian visions for the Arctic. He argues that an “Arctic Spring” has the potential to transform the Arctic Basin “much like the Prague Spring promised to open up and integrate Czechoslovakia with the West” (p. 343). The hope it expressed, he continues--while temporarily crushed in 1968--was realized with the Velvet Revolution of 1989. In addition, he stresses the empowerment of Arctic indigenous peoples and sees an independent Greenland as a real possibility. In fact, the editor--who is steeped in a realist tradition--is the only contributor prepared to project Manichean Cold War schemes onto the Arctic in his assessment of future strategic developments. Sometimes, he goes way too far in his analogies--the discourse on the “Arctic Spring” and the “Prague Spring” is a case in point. But he is also willing to contemplate other cooperative scenarios and transformative and empowering possibilities for the Arctic indigenous peoples. Thus, despite the hyperbolic language, the Arctic is, in the end, not seen as a geostrategic fixture, as was the case during the Cold War, but as a region open to different interpretations and outcomes, including emancipatory potentials. The warming trends in the Arctic have been widely documented and seem to have found rather unison acceptance among climate scientists. Secondary effects of this trend are reflected in the political developments in the region, albeit with differences in interpretation as to which path political developments will tread: conflict or cooperation? It is thus a matter of ‘security’ in the region which must be related to climate change. And this is what The Fast-changing Arctic – rethinking Arctic security for a warmer world tries to achieve. The book is subdivided into four sections, ‘Arctic climate change: strategic challenges and opportunities’, ‘Cooperation and conflict: paths forward’, ‘Regional perspectives’, and ‘Concluding observations’. ... there are several contributions in this volume which justify the ‘rethinking’-element of the book. ... It is thus to conclude that The Fast-changing Arctic provides many new perspectives on a traditional understanding of Arctic security with a dominant state-centred, North American focus. From the Journal of Arctic, Antarctic, and Alpine Research, Volume 46, Number 2 (May 2014), p.527-528, http://instaar.metapress.com/content/g8q724062431771u/fulltext.pdf. Reviewed by John D. Jacobs, Honorary Research Professor, Department of Geography, Memorial University of Newfoundland St. John’s, Newfoundland and Labrador. The Fast-Changing Arctic is more about the geopolitics of the Arctic than the rapidly evolving environmental changes taking place there. However, anyone who does research in the Arctic must be sensitive to the politics at some level and will be interested in policy matters that can be informed by science and ultimately will affect the future state of the Arctic environment. This book is a collection of 16 substantive chapters arranged under the headings Arctic climate change: strategic challenges and opportunities, Cooperation and conflict: paths forward, Regional perspectives, and Concluding remarks. The 17 authors encompass a range of relevant experience and expertise, and include academics, military and diplomatic professionals, and journalists. None appear to be from indigenous Arctic communities, although several of the chapters deal with emerging indigenous governance and power-sharing issues, particularly in Alaska, Canada, and Greenland. There are extensive notes and references, numerous maps and other figures, a comprehensive index, and information about the contributing authors. Most of the chapters have appeared previously as articles in foreign policy and international law journals dating between 2009 and 2011, but they provide good background to things to come. Arctic warming and associated diminishing sea ice and other physical and ecological effects are sketched in several chapters, with reference to model projections for future change. That the decline in seasonal sea-ice extent has outpaced most model projections is noted and becomes a source of some urgency, as in Alun Anderson’s statement, “action to look after the Arctic must accelerate too.” ....The Fast-Changing Arctic is a comprehensive treatment of current Arctic policy issues by authors with diverse backgrounds and perspectives. While the book lacks some of the continuity of a focused work by a single author, the editor has succeeded in organizing the various contributions into a coherent whole. This book joins a growing literature on politics, resource development, and environmental issues in the Arctic, and should be of interest to anyone who has an interest in the future of the region. Ranked #1 in polar history by Amazon Canada on March 1, 2014!!!! 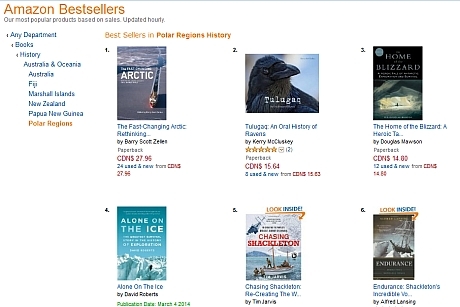 Ranked #1 in polar history by Amazon Canada on March 1, 2014, and #4,270 overall nationwide! Thank you, Canada!!! 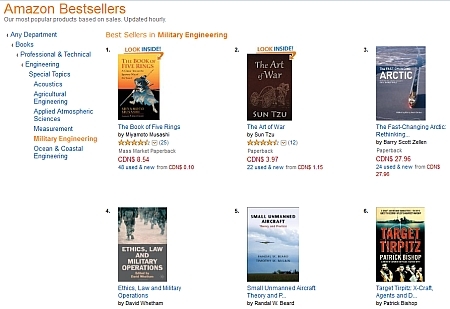 Ranked #3 in military engineering by Amazon Canada on March 1, 2014, just after Miyamoto Musashi (#1) and Sun Tzu (#2) -- two great authors to follow!! 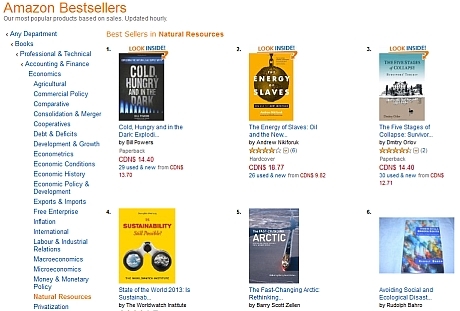 And ranked #5 in natural resources by Amazon Canada on March 1, 2014!